Doug and Marna live near Marna’s hometown of Hitchcock, Oklahoma on the family Centennial Ranch and share a love of history in many ways. 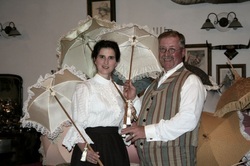 They are currently finishing their new shop, and enjoy collecting antiques that complement their many interests. They have performed for many historical societies, schools and groups including the Buffalo Bill Historical Center in Cody, WY , Oklahoma History Center, and The Annie Oakley Foundation. They also have two daughters ages 9 and 15 that they include in their historical venues. Marna Jean has her own line of historical patterns based on her studies and her private collection, and loves to educate the public on Victorian era clothing. Doug works on the family farm and creates historical saddles in his “downtime”. Doug has worked as a professional cowboy on ranches in Wyoming and Missouri. His love of history grew from his heritage- his great grandmother was a full blood Cherokee, and his grandfather was a cowboy out west around the turn of the century. Doug's young life was spent dancing at pow-wows and teaching others Native American lore, leatherwork, and woodcarving. He became interested in antiques and later built and shipped reproduction furniture all over the United States. His other interests are historic preservation through reenactment, storytelling and singing the old cowboy songs; hunting; making custom boots, custom carved gun stocks, and blacksmithing. Marna is a seamstress specializing in historical clothing. She has raised sheep all of her life, and has been spinning since she was 10. Her interests in costuming grew from attending the many demonstrations she would give with her spinning wheel. She has traveled all over the United States studying costume collections, and been involved in many living history days at museums, threshing bees, and rendezvous, and other gatherings. Her costumes have won awards for being authentically reproduced. Her motto for reenactments is to show history as it really was, down to the last stitch. Some of her other interests are shoemaking, tatting, embroidery, felting, hunting, and riding side-saddle.